If anyone knows their way around some gorgeous glitter, it’s the folks at Violet Voss — they’ve just given us a look at some incredibly stunning rainbow swatches that have us drooling. Our fingers and toes are crossed hoping that this means a vibrant glitter palette is on the way. We can safely say that if anyone is as passionate about a luminous shimmer as we are, it’s Violet Voss. The shades that they gave us a peep of stretch across the expanse of the most beautiful rainbow you could imagine, with rich, bold shades flickering in the light. We’re going to need them to give us details on these beauties, STAT. 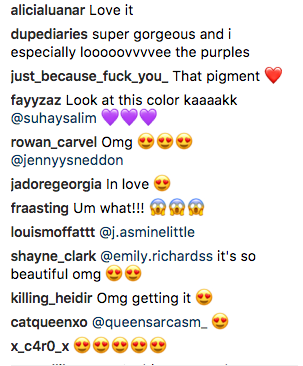 The rainbow swatches Violet Voss has been teasing us with are just a small reminder of how much great makeup they’ve got in store for us. Have you ever seen anything so beautiful? Yes, it’s true that there’s a lot of metallic rainbow makeup on the scene at the moment, but having more choices only gives us more freedom to pick the product that’s best for us. We welcome them all! 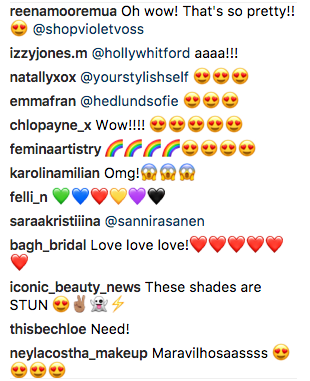 As you can imagine, fans are going wild over the possibility of a rainbow palette, and who can blame them? We’re right there with you, pals. There’s always a chance that these won’t be released as a palette and that they’ll be single shadows instead, but we have a feeling they’ll stick to their format of releasing gorgeous palettes with these hues. Either way, we’re ready for anything and will be pumped to get the chance to sport these lovelies on our lids. Keep your eyes peeled on Violet Voss’s social media pages and website for hints on a possible release date. We can’t wait to find out more about these truly spectacular, bright shades. We are ready to go forth and shine like little rainbow beacons of light.